Two Step Total Transportation Worldwide has been serving Colorado since 1995. During those years we have built a company foundation of outstanding service, consistency and professionalism. Our perfect A+ Better Business Bureau record shows that we are truly one of Colorado's top limousine transportation leaders. Owner, Barbara Curtis started her career in the limousine industry with the birth of Two Step Limousine, Inc. in 1995. She came to the industry with a background in insurance as a commercial and excess surplus lines underwriter. This helped her to understand loss prevention as well as the aspect of driver training and safety. Right behind safety is her passion and love for details for customer service and satisfaction. 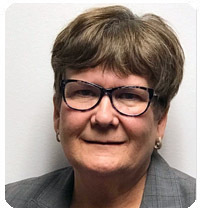 Barb has been very active in this industry starting with Two Step becoming a member to the local association, Limousine Association of Colorado. She has served as president for 2 consecutive years followed by Chairwoman of the Board and finally Vice President for a number of years. In 2003, during her tenure as President, they won the coveted Association of the Year Award. The following year, Two Step Limousine, Inc., won the Small Operator of the Year. This was a major achievement and honor when 85% of the industry is in that category. These awards are very special to her. In 2004, she set her sights on the national front, Barb was elected to the Board of Directors for the National Limousine Association. During her 6 year tenure, she sat on the Executive committee for 5 years as Secretary. Barb’s dream came true when Women of the Industry Program was unveiled several years ago. 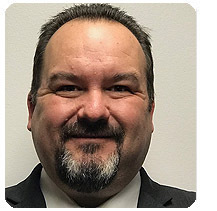 Walter Curtis has been active with Two Step Limousine since its birth, becoming full time in 1997, as Vice President. His two personal prom transportation experiences, which were dreadful, led to the inception of Two Step Limousine. He came to Two Step with years of customer service experience realizing the need for a great customer service and integrity in the Denver Market. He is responsible for the day to day operations in Colorado and building and maintaining the worldwide affiliate program. He has been active in the Colorado Association as well as being elected to serve on the Denver Airport Advisory Ground Transportation Board. Our phone lines are staffed by real employees during our hours of operation. You may send us an email 24 hours a day. We do not use an answering service - get the questions you want answered right now, not later. Whatever your destination, our professionally trained chauffeurs will transport you in comfort, style and safety. Service is available 24 hours a day, 7 days a week, 365 days a year. 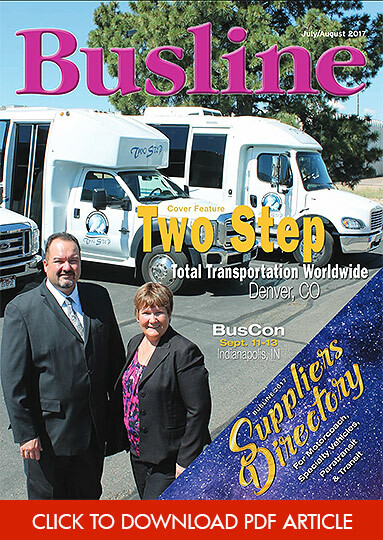 Two Step Total Transportation Worldwide's company story and rise to successful executive shuttle transportation service was featured in July/August 2017 Busline Magazine. Two Step was honored with The Limo Digest Show "Small Operator of the Year Award" for 2010. We have also won the prestigious Operator of the Year Award in 2004, awarded by the Limousine & Chauffeured Transportation and presented to us at the National Limousine Show. We have been named as one of the top wedding transportation companies for the past 8 years in "5280 Magazine". Two Step Total Transportation Worldwide offers complete destination transportation for Colorado and worldwide in over 450 cities. ONE CALL WORLDWIDE SERVICE - Two Step Total Transportation Worldwide can provide its clients with professional ground transportation services around the globe. We know that once you have used Two Step Total Transportation Worldwide, you'll discover why we are truly "Two Steps Above the Rest". Two Step Total Transportation Worldwide specializes in high quality chauffeured transportation service. Our professional fleet offers the latest in body styles and each one of our vehicles is kept to the highest industry standards. Your vehicle will arrive clean and stocked with cold waters, ice and amenities that will make your travel experience comfortable and memorable. All of our vehicles are in excellent condition inside and out - we take pride in our service and presentation of our vehicles. We are members of both the Limousine Association of Colorado and the National Limousine Association. These organizations work to establish an excellence in our transportation industry and to conduct our companies in the highest moral and most ethical manner at all times.